Reverse is a modern George and the Dragon design. Mintage: 30,299 (may include coins issued as part of a set). Minted at The Royal Mint. 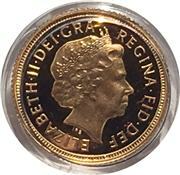 The 2005 Gold Half-Sovereign Proof is an example of the Gold Half-Sovereign and is a gold coin, being as it suggests, half the value and half of the gold weight of a gold sovereign. Today, the half-sovereign is a commemorative coin, not issued every year and often only collected as part of a set. 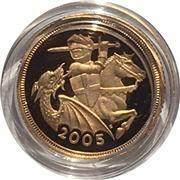 Do you want to buy or sell a 2005 Gold Half-Sovereign Proof? Selling to M J Hughes Coins means that you do not have to pay sellers fees, Paypal fees or any other transaction fees. They will give you an immediate offer and pay you the same day. Single coins or entire collection. Buying from M J Hughes Coins gives you a money-back guarantee of authenticity. Visit http://mjhughescoins.com.